The Inconsistent Nomad: Cemeteries are fun! When most people go to Arlington National Cemetery in Washington, D.C., they go in search of sites such as the Tomb of the Unknown Soldier, Robert E. Lee’s home (Arlington House), and JFK’s grave. Some visitors might even be there to witness a funeral procession involving a military band, color guard, and/or a firing party. It’s a beautiful place that really brings an awareness to the sacrifices that so many have made in the defense of the country and of freedom in general. Royden took me to the lot where the telehandler sat and went over the controls with me. It was pretty basic - an accelerator, a brake, a steering wheel, and a joystick to operate the boom. The concrete vaults stored on the lot weigh about a ton apiece. 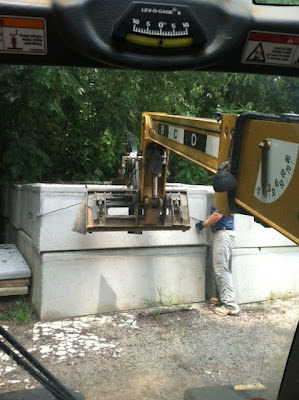 I was driving a huge piece of machinery in the most famous cemetery in the nation. Of course I wanted to pick up a vault! I was giddy. 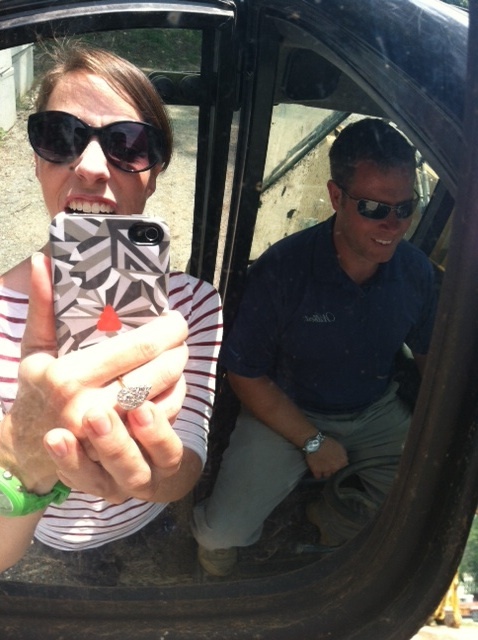 Royden walked me through the movements, hooked a vault to the telehandler’s boom, and guided me through the lift. 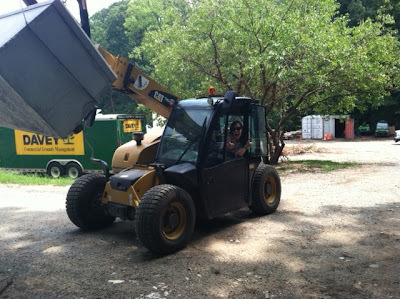 I watched 2,000 lbs of concrete dangling from a hook that was under my command. My inner dork was having a field day. It’s not every day that someone gets to have something called “fun” at a cemetery. I also learned much more about the operation of Arlington Cemetery itself than just how to pick up a large hunk of concrete. In fact, one of the cemetery employees that Royden introduced me to told me one tidbit that made my day almost as much as my telehandler excursion - Arlington staff will never, ever ask a funeral party to depart a gravesite, no matter how long they linger. Having been in this situation myself, being herded out of a graveside ceremony to help a cemetery keep their own schedule, I was extremely pleased to learn that Arlington has such sympathy, honor, and respect for the families of those that are buried there.